→Pancake Compressor vs. Twin Stack Compressors – How Do I Choose? When buying an air compressor for home or commercial/industrial applications, the sheer variety of compressor options can be overwhelming. However, the majority of compressors tend to come in two varieties: pancake compressors and twin-stack compressors. 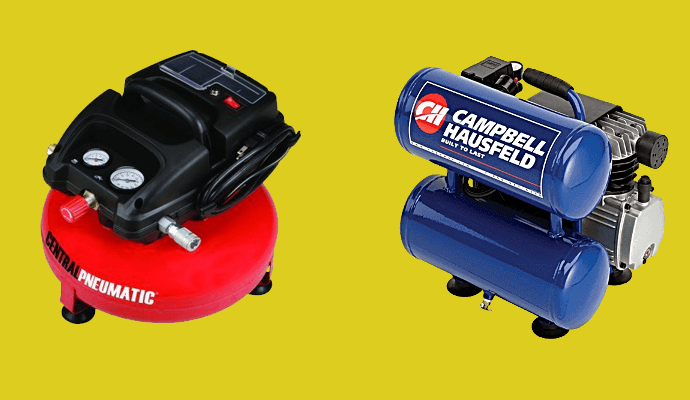 For a first-time buyer of air compressors with little to no idea of how they work, you’d certainly be at a loss as to which one of these two you will purchase. To understand, it is best to look at each of the two types and see what are the disadvantages and advantages of one over the other. Air compressors are commonly found in households, taking their name from their shape. Pancake air compressors are small and round—basically they have the shape of a pancake. Its advantage over the twin-stack compressor is its size, which allows for easy storage and portable use. Because it does not require much space, you could pretty much place it in any corner of your house. Just make sure to keep it away from children, of course. Another advantage of pancake compressors over their twin-stack cousins is their high-pressure output despite coming with a small tank. Pancake compressor tanks usually have a capacity below 8 gallons, and this low footprint allows it to be relatively energy efficient. Another desirable feature of pancake compressors is their low noise output. Because they use only a little power, their motor generally produces very little noise—a must-have if you’re operating a compressor in residential areas. Pancake air compressors are generally built for handling smaller tasks such as inflating car tires and DIY paint jobs. If there’s one word to describe the twin-stack compressor with, it would be power. Indeed, the twin-stack compressor is basically just a hotdog compressor with twice the number of tanks. The main advantage of a twin-stack compressor is its being maintenance-free. This means that the machine takes care of itself and all you have to do is just use it for whatever tasks you have in mind for it. And despite being larger, many twin-stack compressors are still relatively portable and easy to store, although it is nowhere near as space-saving as a pancake compressor. Its mainly horizontal design means it consumes a considerable amount of space, so you’ll have to make some place for it when you buy one for your home. Two people may be required to carry the twin-stack compressor, as it is bulky despite being lightweight. As for power, the twin-stack carries nearly the same amount of power as the pancake. A hotdog compressor typically has 1-3 gallons of capacity in its tanks, so a twin-stack compressor can have 2-6 gallons of capacity. A twin stack is also reportedly more expensive than the pancake compressor. As mentioned earlier, making a choice can be quite tricky. Both models or variants of air compressors each has their own advantages, as you can see from the descriptions above. Now, the first step in identifying which compressor suits you best is to decide what it is you’re going to use it for. Certain applications need a minimum level of horsepower, so you can easily determine what the demand is going to be if you know which tasks you expect to use the compressor for. Second concern, and probably more influential in this case, is your budget. Each type comes in its own price range. You’ll have to know how much you’re willing to spend for the compressor. In most cases, the budget narrows down your choices considerably. Last but not the least is the compressor model’s specifications and features. You’ll have to do a thorough search for this one, but fortunately, a lot of information is available online about what different air compressor models are capable of.